This all goes back to California’s successful 2016 ballot initiative, in which 57 percent of the state’s voters elected to fully legalize marijuana. At that point, California became by far the biggest state to legalize pot. Until Election Day 2016, only four relatively small states had done so: Colorado, Washington, Oregon, and Alaska. Altogether, these states hold more than 17 million people, and their cumulative annual economic value totals around $1 trillion. In comparison, California alone is home to more than 39 million people and is worth around $2.5 trillion — more than twice as populous and wealthy as all the previous legal pot states combined. [S]ize matters. While the previous legal pot states had relatively small economies and, therefore, relatively small marijuana industries, California is a behemoth. GreenWave Advisors, a cannabis financial analyst, estimated that California’s industry could be worth $5.1 billion in 2018. One report from researchers at the investment bank Cowen estimated that legalization in California alone would triple the size of the nation’s legal pot industry within a decade. Labor leaders estimate recreational pot in California could employ at least 100,000 workers from the north coast to the Sierra Nevada foothills and the San Joaquin Valley, harvesting and trimming the plants, extracting ingredients to put in liquids and edibles, and driving it to stores and front doors. The United Farm Workers, Teamsters and United Food and Commercial Workers are looking to unionize the tens of thousands of potential workers involved in the legal weed game, from planters to rollers to sellers. The move could provide a boost to organized labor’s lagging membership — if infighting doesn’t get in the way. Teamsters organizer Kristin Heidelbach said there’s no need for unions to battle each other. There will be plenty of workers needing representation as small cannabis businesses run by “happy stoner” types give way to large pharmaceutical corporations, she said. Six plants, however, seems like more than enoough, and I’m sure big box home and garden centers will end up stocking some sort of “fully enclosed and secure” solution. Attorney General Jeff Sessions is rescinding an Obama-era policy that helped states legalize recreational marijuana, throwing a wet blanket on the fledgling industry during what should have been a celebratory week. Shares of pot companies plunged. The Justice Department will reverse the so-called Cole and Ogden memos that set out guardrails for federal prosecution of cannabis and allowed legalized marijuana to flourish in states across the U.S., according to two senior agency officials. U.S. attorneys in states where pot is legal will now be able prosecute cases where they see fit, according to the officials, who requested anonymity discussing internal policy. On this issue, Cory Booker has done the right thing. Let me repeat that: Cory Booker has done the right thing. He has introduced bill legalizing marijuana at the Federal level. I know I’ve beaten up on Booker in the past, and he’s certainly deserved it — how on earth does a putatively progressive Democrat actually maneuver themselves to Obama’s right on private equity? I’m still steaming! — but when Booker does the right thing, he should get credit for it, which in this case I’m happy to give. The bill is “S.1689 – Marijuana Justice Act of 2017,” and shamefully — shamefully — only one Democrat (Ron Wyden) co-sponsored it with him (even though Sanders introduced legislation to legalize marijuana in 2015). The proposed legislation would be retroactive, as it would expunge previous federal marijuana use and possession crimes from people’s records while allowing those currently imprisoned for marijuana-related offenses to apply for resentencing. [The bill would] withhold federal money for building jails and prisons, along with other funds, from states whose cannabis laws are shown to disproportionately incarcerate minorities. Those “aggrieved” by a disproportionate arrest or imprisonment rate would be able to sue, according to the bill. 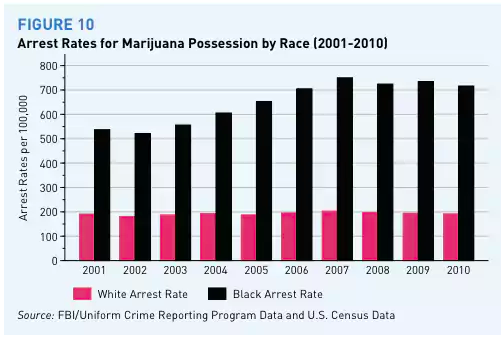 As you’re probably aware, black Americans are arrested for marijuana possession far more frequently than whites. You may also know that there’s not much evidence that black people consume marijuana with greater regularity than whites do. Booker doesn’t use the charged word “reparations,” but looking again at that table of arrest rates, I think a make-good is in order. Booker’s bill is a good bill. Marijuana should be legal. Those arrested for it should have their records expunged. States that criminalize marijuana but enforce the laws unequally should pay a price, and people should be able to sue them for it. And the communities destroyed by the so-called “War on Drugs” should be given the resources to rebuild. And you’d think the Democrats would want to appeal to 64% of the population by backing both legalization and decriminalization. But no. Perhaps they feel that suburban Republicans wouldn’t like that? The Los Angeles Times: “Booker isn’t the first lawmaker to call for erasing marijuana from the list of controlled substances. Sen. Bernie Sanders (I-Vt.) introduced a bill to do that in 2015. Earlier this year Reps. Tom Garrett (R-Va.) and Tulsi Gabbard (D-Hawaii) proposed it with a measure called the Ending Federal Marijuana Prohibition Act. So did Rep. Jared Polis (D-Colo.) with his Regulate Marijuana Like Alcohol Act. All of those measures would let states decide whether they want to legalize or not.” Only Sanders, as a Senator, could co-sponsor Booker’s bill. I would think that as a simple matter of comity, he would. Pecksniff me no pecksniffs on the rule of law, after the executives who committed accounting control fraud in the Crash were given impunity by Obama’s Justice Department. So, a canny political move as well, one which the otherwise horrid Terry McAuliffe also made. This entry was posted in Guest Post, Politics, Regulations and regulators, Social policy, Social values on January 4, 2018 by Lambert Strether. TBH this bill would be great for me since the Army Review Board is at the Federal level. Might even get my GI Bill eligibility back! So we have a Republican setting up a major states’-rights confrontation, with the biggest state. Among other things, this should give the independence initiative quite a boost. All the legalization states should start promoting jury nullification. that should make it impossible to get a conviction – it only takes one, if they have the nerve. Not such a bad idea. Moar volatility! The majority of criminal cases are resolved with a plea agreement. There is no formal prosecution, and no jury trial. In cases that do go to jury trial nullification is unlikely in the extreme to have any effect. In the US there has been progression of attitudes by courts/judges, with the current attitude eliminating any application of nullification by juries altogether. 1) In the late 19th century courts/judges determined they were under no obligation to inform juries of their nullification powers. 2) Courts/judges began to penalize anyone that attempted to inform juries of their nullification powers. 3) In the mid 1980’s case law developed regarding jury instructions that went further and stated “There is no such thing as valid jury nullification.” That case law, and its import, have only gained momentum, and strength, since. In civil cases there are myriad ways to keep a case from going to a jury trial. Probably the most frequent is to hold a bench trial instead. If the court/judge, or one of the parties, wants to avoid a jury trial a motion for bench trial can be made. That is an obstacle to a jury trial that must be overcome in order to be “awarded” a jury trial. Before any trial there are numerous ways to be distanced from a jury trial. Motions for judgment on the pleadings. Motions for a directed verdict. In the unlikely event a civil litigant is able to jump through all the procedural hoops, dodge all the bullets fired by adverse parties (and the courts), and actually get to, and through, a jury trial, the loosing party can file a motion for judgment notwithstanding the verdict. The court/judge can then, in short, simply replace his/her own judgment in place of the jury. Folks in the US have a lot of ideas about what due process, and justice, are … what they look like, and what they entail, but mostly those ideas are NOT the reality. You think pot is big money? Or, this is how the republicans stay in power. Federal criminal conviction of users, growers, distributors, and investors. You say all those things like they’re bad! The final frontier of marijuana legalization is how doctors will approve it for use by private & commercial pilots. In my life I was able to do all the experiments with both marijuana smoked & hashish & hash oil. Hashish was what was preferred in Canada when I lived there in Rochdale College & was hired to work on Security. My experiments indicate that 24 hours from joint to joystick will be fine for pilots when the pot has been smoked. A high is typically done after 6 hours from smoking the evil weed. Federal Legalization is absolutely necessary. Ironic to read of the Teamsters all over the idea of unionizing the pot industry labor. It was their decision to use mob muscle instead of doing the dirty work all on their own that sold out labor in the 20th Century. I’d be reticent in recommending pot labor join the Teamsters if this is more of the mob in disguise. Any Pot legalization bill that does not address Pilots, Train Engineers, Truckers, or even race car drivers is flawed as incomplete in my judgement. Nuclear plant workers granted (unescorted) access to the power block are also prohibited by Federal regulation from using, and are subject to random urinalysis. How well will Joe Public sleep at night knowing that the people operating their nuclear plants and flying their commercial airliners might be under the influence? It’s much harder to test for this than it is to test for recent alcohol consumption, since it shows up in your blood for weeks after only a single use. I personally think legalization of all these substances is a great idea for so many reasons, but with one proviso. There needs to be a real “sea change” in attitudes about substance abuse, to the effect that one is always fully responsible for one’s actions, even if under the influence, since it was a personal choice to ingest such substances. For example: Killing someone accidentally while driving because one is “too drunk (stoned?) to know what one is doing” is depraved indifference for human life. Am I reading this wrong? It looks like Wyden cosponsored Booker’s bill in December. You are correct and I fixed the post. I misread the page (“includes 0 original”). Do you think Sessions is motivated by the fact that black people are far more likely to be arrested for marijuana offenses than white people? Perhaps. Most charitably, I chalk it up to plain old stupidity and willful ignorance. In the world of these types, the only “drug abuse experts” are those who’ve never done any. Pot prohibition has never been about “the weed.” It’s simply a handy tool for arbitrarily detaining people and ruining their lives, particularly young men of color. No one really believes that cannabis is as dangerous as heroin or acid. But it’s frightfully easy to bust someone for a fragment of plant material. Once arrested, plea bargaining can net many more undesirables and ruin their lives too. Prohibition of cannabis is 99.9% about controling, punishing, and profiting off marginalized communities. Probably not. But he still did the right thing in this instance. But it’s because he hopes to be President in 2021. And I’m guessing Cory knows where the heat on the street is going to come from. This is a boneheaded maneuver on Sessions’ part. Booker deserves praise for submitting this bill, and also to have you vote against him if he runs for office in your vicinity. Usually, DC grinds them down. Or sideways, see Warren. Is Booker getting free passes to groom him and the deplorable progressive left-like? Stay tuned. I lived in Hoboken, down the street from Newark, as Booker entered his second mayoral term there. It was largely thought on the street that the formerly inspiring young star had been utterly compromised by the big real estate developers. I thought he was going to be a straight party Dem from there on out. He still flips between libertarian and neo/paleo liberal and yes-thats-actually-progressive on what seems like a monthly basis. He remains interesting, I don’t know for what though. And ya know… after Trump, maybe we should seriously consider a chameleon. Have a kind of political round-robin of satisfaction/dissatisfaction, everybody gets a turn. Or is that what Booker wants us to think?!?!? > It was largely thought on the street that the formerly inspiring young star had been utterly compromised by the big real estate developers. If you want to see the real Booker, look at how he helped privatize the public schools in Newark, as part of a coalition that included Governor Christie, Mark Zuckerberg and the opportunistic so-called reformers who are feeding off the carcass of the Newark public school system. His proposing this legislation is a good thing, but as a public school teacher, I still wouldn’t piss on him if his heart were on fire. Seen cynically, the ‘reversal of drug war harm’ elements of the bill are woke virtue signals added as bargaining chips to be cashed in as needed. You’re right; I should have worked through that. I’m still feeling my way into this topic. I can buy a 35 pound box of navel oranges here for $10, and 35 pounds of marijuana is worth $70,000. I’m curious to see what farmers/orchardists do, will it be a “Great Leap Forward” gig where everybody and their brother produces way too much and prices plummet, which isn’t a bad outcome, really. IIRC (from reading, not experience), the price of alcoholic beverages dropped 70% after prohibition was repealed. If the risk premium for weed is about the same, it leaves a lot of room for producing public revenues and union benefits and would still bring down the retail price. We grow our own here in the sf bay area and recommend doing the same to all who can. If you can grow tomatoes, you can grow weed. Have you ever encountered any of these National Forest grow sites. I’ve heard the folks that run them can be quite dangerous; not to mention phking up the environment. The cartel typically employs campesinos from Michoacán who are a few layers removed from anybody that knows anything about the operation, and they’re the ones that get busted. Really just innocent farmer types recruited to make some do re mi. It’s frustrating to arrest them, a narc friend told me, as they know nothing. Deliveries of food, fertilizer, gas & painted ladies etc. to their campsites are usually local Central Valley types, Cutler, Orosi, and Earlimart provide most of them, around these parts. I did read a factoid a few years back (I don’t have the link but I am sure it is out there) stating that the sale of marijuana still made up as much as 75% of the major cartels’ annual profits. If this figure has not changed dramatically in the ensuing years, then it is possible that Booker’s law would do more to lessen drug related violent crime than every bust made by the DEA over the past however-many decades. I think the cartel realizes if they keep it on the downlow, and if you lose a couple gardens with 5 peons here and 6 in the other, oh well, 3 other gardens with 56,834 plants were harvested, when all is said and done. And like their countrymen diligently tending the many flocks of tree orchards on the fruited plain below, they’ve got the greenest of thumbs, an affinity with the earth. A shooting would cause us to get uppity with a lot more helo flyovers, etc. MJ sticks out like a sore thumb being about the only really green growing thing during that time of year in late summer, unless cleverly camouflaged, which they’re also adept at. Our weakness is the cost of doing this. The helo time is a pretty penny, the essentially special service interdiction teams have to be specially trained, covered with body armor, they might be toting 40 pounds including weaponry, etc. and it’ll be 80-100 degrees walking @ 2-5k altitude lower climes. The cartel spends pennies versus us blowing through Benjamins fighting it, in getting the supply to the demand. 3) The vast variety of quality-controlled offerings in Amsterdam as opposed to the more seasonally constrained SF market. An old friend who now lives in Oregon managing a large operation on a 60k yearly salary says he expects 2018 crop to fetch 500 per lb. wholesale. So your locals 70k (which is probably half of what it was 5 years ago) now competes with 17.5. Six plants is a lot for recreational users, but for heavy medical users it is not nearly enough: considering the need for continuous cropping from clone to mature plant, you’ve got to have a lot of baby plants in the pipeline for later maturity. The cost for a “fully enclosed” (basically, an indoor grow) is prohibitive for low-income people, so once again, disabled people who rely upon cannabis as medicine will get screwed. So while this is a step in the right direction, the new law will tend to favor people with more resources who can afford to buy as much as they want, or set up an expensive indoor grow. The only long-term solution is to legalize it fully and allow outdoor home grows with no restrictions. This will crater the price, of course, and make cannabis only slightly more valuable than fresh basil…not what Big Weed or Big Pharma want, so we’ll likely not see this anytime soon. Pot marjoram is worth a few bucks an ounce, and if pot were to drop down to that level nobody would grow it, but somewhere around $25-50 an ounce would be schweet. Well good for Cory “no unsafe generics from Canada!” Booker. I didn’t think he had it in him. Anti-depressant: It combats anxiety and depression. Anti-convulsant: It suppresses seizure activity. Anti-oxidant: It fights neuro-degenerative disorders. Neuro-protective: It protects the neurons in the brain. Anti-emetic: It reduces nausea and vomiting. Anti-inflammatory: It combats inflammation and also the pain. Anti-tumoral: It combats tumor and cancer cells. Not only CBD is non-psychoactive, but research has shown that it is non-toxic and there is no risk of lethal overdose. A 2011 review on the safety and side-effects of CBD managed to show that large doses had no effects on embryonic development, digestion, food intake, motor activity, movement, blood pressure, body temperature and heart rate. Yeah, no accepted medical value there. Heck, we should be adding it to breakfast cereal and tap water. Cory Booker is from the state with the most pharmaceutical companies. And you thought Booker was doing it for all the poor black kids. No, he is a leader in crafting any new law in favor of Big Pharma. Ka-ching. In politics, sadly, it’s possible to do the right thing with the wrong motives. I think the decriminalization part of Booker’s bill is important and just. And it’s hard for me to see the direct benefit to Big Pharma in doing it. One possible scenario: Pharma gets what it wants, thanks to its wholly-owned subsidiary Cory Booker, while the decriminalization section gets stricken, with nary a peep from the junior senator from New Jersey, who then continues to get the liberal adulation and credulous news coverage he’s enjoyed his entire career. The “right” of the police to humiliate, beat, jail or kill anyone shall not be abridged. Shouldn’t we want Sessions to crack down on weed so in the resulting lawsuit Sessions would have to prove schedule 1 was warranted? That would be a hard sell and if we won would be a hard precedent to overturn. Waiting for congress to act seems unrealistic due to their age demographic despite Bookers attempts. He knows that and this is naked pandering. I give him credit but this was a no brainier for him. On visits to Denver area last an prior year, and hearing from residents, there was gloom, then desperation. The influx of eager well-off potheads had shot real estate and rental prices well beyond prior averages, and beyond many working/precariat budgets. Last word was things are getting worse as pot prices tumble; anecdote≠data, but it can be fact. Here’s another caveat, speculative but not incredible… yes yes, Motley Fool, hear them out. Falling prices are usually good for consumers, but the possible reason behind this drop in pot prices is a double-edged sword for investors and consumers. For those who may not recall, Colorado extended a moratorium on growing license issuances last year, which allowed those who’d already acquired a license to maintain control. This is especially true given that these grow licenses had no limits on the number of plants that could be cultivated on a grow farm. Additionally, nothing stopped big business from gobbling up as many licenses as they could afford in Colorado. The result is that just a few larger players wound up with a majority stake of the Colorado grow market. Now, if you’re a big business and you want to eliminate your smaller competition, what do you do? Like Wal-Mart, you slash your prices to undercut the competition. Yes, this lowers margin, but you have deep pockets and your smaller competitors probably don’t. Once you’ve sent them out of business or out of market, you’ve won the right to control more market share and command a higher price point for your product. The way big business in Colorado is conquering smaller businesses is by flooding the market with dried cannabis. While this is a win for consumers in the short term, I suspect it’s an anti-competitive tactic that’ll substantially increase prices over the long run. While that’ll be great for investors, it’s not such good news for consumers. Of course, big business’ takeover of the pot industry isn’t just something we’re seeing happen in Colorado. Canada, which has been a source of great success for the green rush and investors, looks to be dominated by just a handful of larger businesses. Back to anecdote: an acquaintance and near-neighbor works as electrician and plumber on a construction crew that converts warehouses to growhouses. Because of the rush to production, he often works on partially finished and already producing sites.He gets to wear a bunny suit (full body overall) and facemask like the plant tenders, but he has to cclimb rigging and apply muscle to tools, and the protective clothing is hot and restrictive, so risks exposure without it. The work conditions are extreme. Growers pump CO₂ into the growing areas which is pretty much the whole warehouse. Hanging sheets of plastic trap air, dust and heat, fumes from hydroponic media. The lighting is UV rich, not so much on the human-visible spectrum. My pal is 62 and fairly spry, but has passed out on the floor several times, leaves work dazed and exhausted after 6 hours. Pay for tenders/trimmers is in the $12/hr range (but you get to collect and resell shake, so it’s an opportunity for the marginalized/desperate). Some houses currently do not supply masks or gloves, workers have to bring their own. IMO the weed isn’t that great either, with odd chemical overtones and finishes, not the rich and broad skunks and fruits of yesteryear (I generally avoid pot now, but smoked for decades earlier in life). But it’s not a one-sided situation. The industry has been developing specialized strains for specifically narrow medicinal and/or psychotropic effects. Another acquaintance has been struggling for years with medications for bipolar syndrome, all of the pharmaceuticals have some kind of awful side effect, weight gain, depression, fertility/performance decline, sleep disruption, etc. This is a 20%-30%er, they’re getting a higher-than-average grade of medical support. They recently got a scrip for a marijuana strain, an oil that they vape. I tried it, it’s very mild, not what I’d call recreational. But the side effects are so far nil, just the settling of the bipolar phases. They are losing weight, engaging socially, finding real health for the first time in their lives. This seems like a great way to be attorney general for three years and then never again. There are many purple states like Florida that have medical programs. From a linguistic point of view, using the 100-year-old Mexican slang term ‘marijuana’ in US criminal statutes is as laughable as using ‘vajajay’ in a medical textbook. But then, ‘leaders’ who grimly continue an abjectly failed War on Drugs aren’t serious people anyway. So it’s perfectly appropriate that they use comical, degraded language … preferably with the aid of a helium balloon during public orations. Helium balloon? Why not a balloon of Nitrous Oxide? In Nitro Veritas and all that. Whereas during the cannabis prohibition, all the quality did was greatly improve. Will ditchweed rule on the basis of price in the future? That is not entirely true. Read up on the U.S. government spraying paraquat on outdoor Mexican cannabis fields in the 70’s. That shifted production indoors in the US and Europe which led to selective breeding that increased THC levels and decreased CBD levels since no one was focused on CBD. While the potency and quality increased it came at the expense of being laced with a host of herbicides, fungicides, and pesticides. Since those bad chemicals are heavily applied during the flowering phase and can’t simply be washed off it means people have been smoking chemical laced weed for years. Canada has taken a huge step by fining any producer more than just a cost of business fine caught using any unapproved chemical. With legalazition you can easily test producers batches and incentivize proper growing techniques to grow pharmaceutical grade cannabis. The effects of smoking all the fungicides, herbicides, and pesticides residues haven’t really been studied but are one more reason to legalize and regulate. The medical use has also heavily relied on CBD levels while recreational use focuses on THC levels. First, shake out the little guys. Then hand the entire industry to Big Pharma. They’ll write bills for Congress to restrict growing to them alone, then they’ll Jack up prices for ditch weed. Stick to a small glass of wine maybe? It is SO ridiculous that pot is illegal federally and Sessions is rescinding Obama policy. I mean, has anyone ever heard of anyone robbing a bank while high on pot? (the thought is almost laughable..) How about domestic violence between a stoned husband and wife? Overdoses by weed? Addiction issues? And yet, any chucklehead can EASILY buy a gun in the good ole USA….. I say keep the Democrats and their Big Pharma owners out of it. Let Jeffie-Reb rattle his Confederate battle flag at them. Corporate weed is poison. Pot for profit is exploitation. The Feds can’t be bothered to come after every discrete little backyard grow.